I had a wonderful time getting acquainted with all of the students today in class at IHOPU. Though our room is on the smaller side, our hunger is definitely not hindered. Many of the students are singers and musicians in the Music Academy, with a passion and calling to sing and play the Psalms. I love the way Dr. Terri Terry has said it since day one. Most music schools and academies endeavor to teach you how to play Bach, Beethoven, and Brahms. Here you will learn how to play the Bible. Rather than looking at a piece of sheet music and playing what is on the paper, here you will look at your Bible and play the song of Moses, the Psalms, and the hymns in the book or Revelation. Yessss!!!!!! I love this! And how rare this is. This is where music, prophecy , imagination, and the illumination of the Scriptures by the Holy Spirit collide. 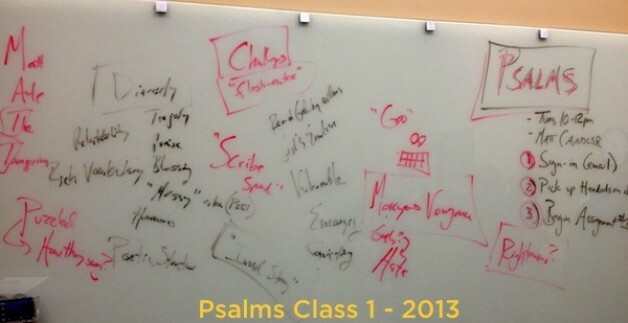 This is the very collision that a course on the Psalms aims to aid. Lord Jesus, as we set our dull hearts before the fire of Your word in these songs of praise, meet us, wreck us, and transform us to play the Bible. Question: Do you “play” the Bible? That is an amazing quote from Terri Terry! Play the song of Moses…. I know! She is amazing. It’s even better when you hear her say it to a group of hungry singers and musicians I am sure you can picture it! I am just now finishing up my degree in Music Composition at my university, and I have to say that singing the Bible has been absolutely necessary in a two-fold way for me as a musician. It keeps me in line with the reason why I started studying music in the first place – to use music as a vehicle for expressing what God is like, not just virtuosic showmanship. And it really does make the Word strike me in a different way than the times when I’m prone to rush through it in reading it. Yes, I have to agree with Dr. Terry! Bach and Beethoven can’t keep my heart alive. What’s interesting to me is that modern Western music theory finds its roots in chant (one variation of which was Gregorian chant). The system was invented in the church as a way for the clergy to meditate and to recite biblical texts to laypeople who might not have had access to the Scripture. So even modern Western music theory was born out of the context of singing and meditating on the Word… which to me is pretty profound! They began to notate and write it down so they could remember it. So the roots of Western music theory are in meditation!